When I first became interested in handwoven carriers, I was trying to reign myself in by only purchasing budget options. One of the first handwoven carriers I ever purchased was a SewFunky handwoven ring sling with a pleated shoulder in a rainbow colour pattern. I bought it directly from SewFunky, and Tanja allowed me to choose my ring colour preference. Shipping was lightning fast (I think she has an in with Canada Post), and I was so excited to receive this beauty. My first impression was how beautiful the colours were together. The rainbow was bright and vibrant. The material was a bit stiff, so I washed it first thing. It came out substantially softer, but had to be worn often for a week or so before I found it anywhere near soft. The weaving was a bit thicker than other budget handwoven brands such as Girasol, but this led to a great texture for a ring sling, as it tightened and stayed put easily. 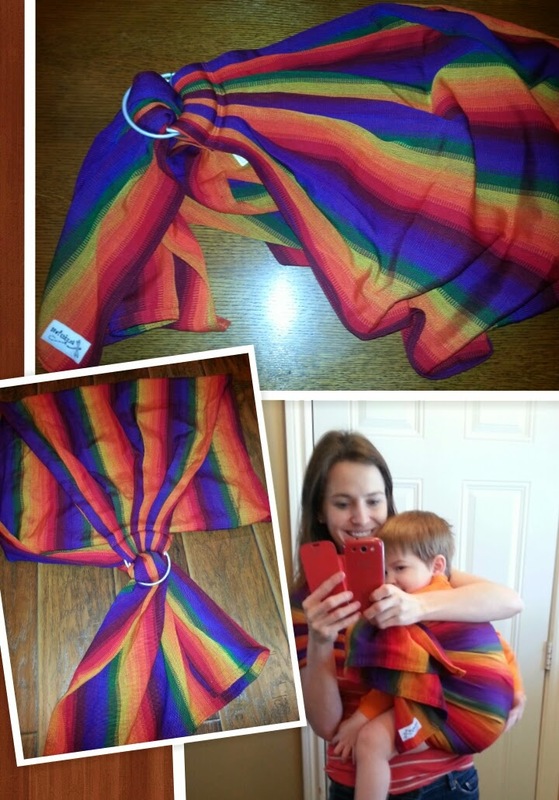 I found this sling plenty supportive for my then six month old, and perfectly comfortable for short trips with my two year old as well. Overall, I thought this ring sling was amazing for the price, and only moved it along when the collection got out of control. Recommendation: I would recommend this ring sling to anyone who is looking for an affordable and beautiful ring sling and doesn't mind taking the time to break it in.